Hiking up Mount Etna as it was erupting, in search of an unusual lava tube. This gigantic lava flow was mostly shrouded in cloud, yet we paused here, to examine some twisted rope lava formations. During a pahoehoe flow the outer skin of lava cools and becomes viscous. The underlying lava is insulated and remains quite liquid. As it flows, it carries the cooler skin along with it, causing it to crumple and fold into twisted shapes. However, during the early stages of the flow, when the lava is hotter, these twists appear like ropes, but later, as it cools and becomes more viscous, the twists are shaped more like entrails. Beneath the solidifying surface, the liquid lava continues to flow, often draining out and leaving hollow cavities which over time collapse. 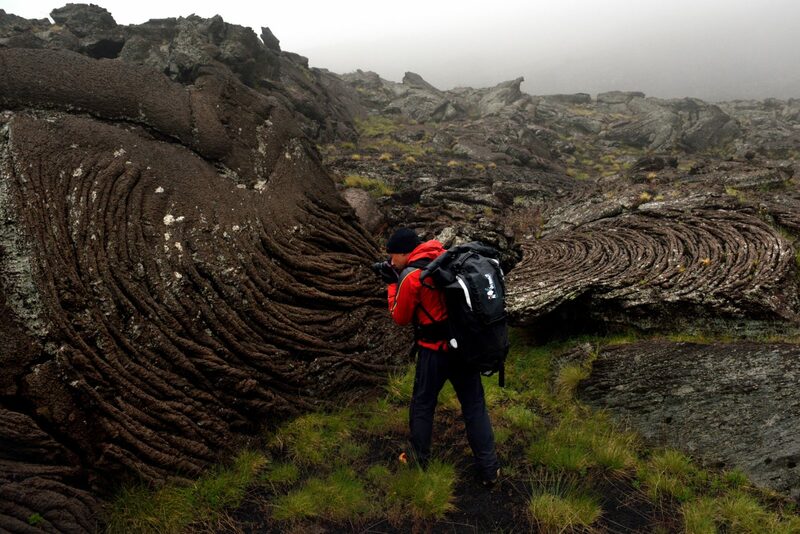 An Italian cave explorer photographs the swirls and shapes of hardened moulten lava.